To be quite honest, I had given up on making hot sauces. Mine were anything but memorable. Then I met Pedro. He arrived for retreat with a group of Hispanic men. They provided the retreat leader. We provided the food. Soon after arriving, Pedro came to the kitchen asking where to store his half gallon of hot sauce. A half gallon! He confided that the men in his group would go nowhere unless they had this salsa. It was his secret sauce. Pedro was older than the other men, most of whom addressed him as “Tio,” a Spanish term of endearment literally “uncle.” He walked about with a gentle fatherly air which the younger men appreciated at least as much as the salsa. By the close of the weekend Pedro and I had become bonded. I was convinced of the bond when Pedro came into the kitchen and quietly told me that he was passing on to me the secret to his famous salsa. I was shocked and honored. That was two decades ago and I still remember the moment, one I hold closely and dearly. What I learned from Pedro is that the roasting, toasting, or frying of the hot peppers is what makes all the difference in the final outcome. Does it ever! In the last twenty years I have worked with a variety of hot peppers for a variety of recipes. This I know for certain: if you do not take the time to roast, toast, or fry the pepper, you have missed out on a heck of a lot of great flavor. There are no substitutes, no way to make it up. Pedro was using dried peppers. This was March and dry peppers were all that was available to him. Come summer he would be using fresh hot peppers. Use either dried or fresh and you STILL roast, toast, or fry. Depending on your palate and your heat tolerance you may be more interested in the mildly hot peppers like the Santa Fe or the rellano-type pepper. On the hotter extreme you could go with habanero or Hungarian Carrot. With any variety, always test for heat. In some seasons the peppers carry little heat. You will want to use more than usual. At other times the peppers will be hotter than you expect. Just know the heat level of the peppers at hand so you can make reasonable adjustments to your mixture. For his salsa Pedro was using fourteen Serrano peppers. I used five and loved the results. Pedro’s friends would have sent my salsa back to the kitchen. We all have different heat tolerances! The following recipe makes about a quart of salsa. Feel free to double or quadruple the recipe, or cut it in half. Combine the onions, garlic, and tomato in a large saucepan. Cook over medium heat. Bring the mixture to a simmer, then turn the heat to low. Simmer until the vegetables are completely soft and the mixture has reduced by almost a half. While the tomato mixture is simmering, place the peppers on a piece of baking parchment atop a small baking sheet. Roast the peppers at 450 degrees until they are blistered all over. They may even blacken…all the better. Allow the peppers to cool enough to handle. Cut off the top with the stem. Scrape out some of the seeds if you want to reduce the heat. Pull off whatever skin is loose and discard the skin. Chop the peppers a bit with a chef’s knife. Work your fingers into the lemon slice to help neutralize any heat that may be lingering there. Lemon or no lemon, keep your hands away from your face, especially away from your eyes! Place the finished tomato mixture and the roasted peppers in a blender or food processor. Blend it to as smooth a mixture as you like. The resulting sauce is thick. When thick, it is perfect as a spread on a sandwich or part of the filling of a bean and cheese burrito. If what you had in mind was a dip for chips, then add water a tablespoon at a time until the consistency is exactly what you want. Then add salt to taste. Remember, you may be serving this salsa with salty chips, so be light-handed with the salt addition. Store the salsa in an air-tight, nonporous container in the refrigerator. It will last for a good five or six days. Since the recipe makes a quart of salsa, you may want to freeze some of it in small containers. 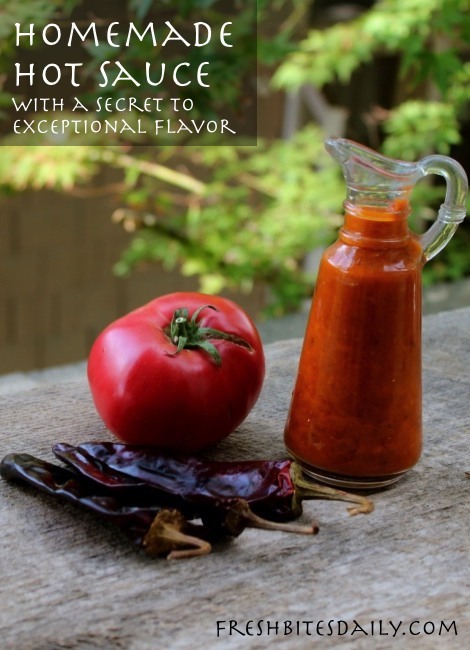 The salsa freezes well and will be a delightful condiment to have handy for a quick meal. 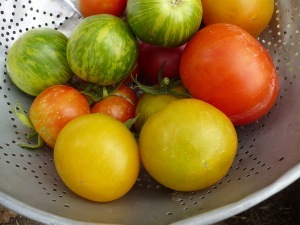 Use yellow tomatoes such as Old German or Yellow Brandywine and use yellow peppers such as Santa Fe. The sauce takes on a golden hue. Since the Santa Fe is one of the milder peppers, you will not have great heat but the flavor is superb! Make the recipe using both dried peppers and rehydrated dried tomatoes. The flavors will be dense, intense and interesting. Great answer for winter! Use a paste tomato such as Amish Paste or San Marzano. These tomatoes were born for cooking. Their flavor reaches peak when they are cooked. Additionally, they have lots of meat, less water and fewer seeds. If your tomatoes seem a bit dull of flavor, add some tomato powder to your tomato mixture as it simmers. The powder adds color and flavor. Great fix! This is a fun recipe, especially using Pedro's secret trick. While the tomato mixture is simmering, place the peppers on a piece of baking parchment atop a small baking sheet. Roast the peppers at 450 degrees until they are blistered all over. Allow the peppers to cool enough to handle. Cut off the top of the peppers with the stem. Scrape out some of the seeds if you want to reduce the heat. Pull off whatever skin is loose and discard the skin. Work your fingers into the lemon slice to help neutralize any heat that may be lingering there. Place the finished tomato mixture and the roasted peppers in a blender or food processor. Blend it to as smooth a mixture as you like. 12 Comments on "Homemade hot sauce with Pedro’s secret flavoring tip for making it FANTASTIC"
Thank you, thank you, thank you. I just wanted to let you know that I have just made this and it tastes amazing!! Yes, roasting is key. It’s amazing what it does to food. Just thought I would shoot you a quick up date to let you know that I had some friends round last night and after trying your hot sauce they asked nay demanded where I got the recipe from so I pointed them over to this post and told them the secret was in the roasting of the peppers. I cannot wait to make this for my hubby. He loves hot sauce on almost anything, the hotter the better. And with so few ingredients, it seems very simple. Sounds like a great recipe…..Can’t wait to try this! Would like to tell you how I kick my homemade hot sauce up a notch….After I put everything in the blender I take a fry pan and put a little bit of oil in the pan and I fry the blended sauce for about 30 min….and then let it cool and put in a jar…..Like I said…it kicks the sauce up a notch!!! ENJOY!!! Hotsauce in the market won’t cost too much, but it comes with a small bottle so I can consume in a short period of time. I always add this tangy taste to my burgers, pizzas or even fried foods. It is a good thing that I could make my own hotsauce with different variations, never tasted any of these. I don’t have that much sauce except when having pizza and fried foods so I’m not too familiar with the varieties of sauces. I like the ingredients you’ve used in this hot sauce. 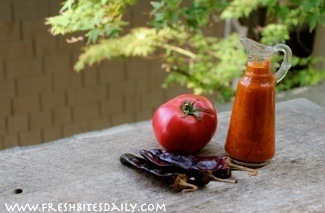 I’m not sure how it’ll come out but I want to make this hot sauce since it doesn’t look too complicated.